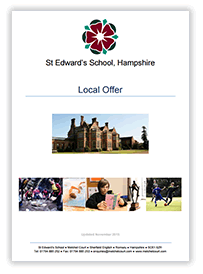 We hope you find our Local Offer (PDF) useful. If you have any queries, please do not hesitate to contact the School on 01794 885 252 or email us at enquiries@melchetcourt.com. St Edward’s is a special school providing care and education for boys who display challenging behaviours as a result of their social, emotional and mental health difficulties (SEMH). Type of Placements: Day and Residential, Monday to Friday, 38 Week. Location: Single rural site off the A27 near Romsey in Hampshire. Which Local Authorities place pupils at St Edward’s? St Edward’s is regularly used by Local Authorities across the south, south east and east of England as well as by several London boroughs. What range of pupil needs does the school provide for? We recognise that many conditions are applied to children and young people; we welcome discussion on how our school may be able to meet pupils’ needs.